Offer your heart to God with 11 joyful songs, ranging from full-blown rock to personal ballads. 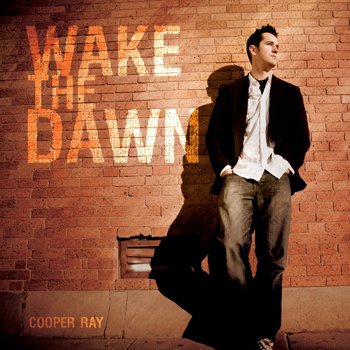 Cooper Ray entertains, motivates and inspires youth and adults across the country. He's presented workshops at the National Conference for Catholic Youth Ministry and emceed catechetical sites at World Youth Day. His relevant message has a way of reaching people down in front, all the way to the back row. Cooper will also be the first to tell you, he's never considered himself a musician. Music had always been a complement to his speaking ministry. But as more and more people approached him, asking for his CD, the more he realized it was time to give the people what they wanted. His solo debut is a testament to the same lighthearted optimism that has already spoken to so many. Produced by Tom Booth, Wake the Dawn is a praise and worship album that draws in listeners of all ages. Cooper's voice catches your ear from the second you hit play. The 11 songs range from full-blown rock—complete with drums, Hammond B3 organ and the guitar licks of Taylor Johnson—to straightforward, personal ballads. "Sing Alleluia" kicks off the album with a joyful opening that makes you want to get up and dance. "Now" begs for you to sing along. The powerfully dynamic "Rain On Me" features chilling cello runs and vocals so heartfelt, you'd swear Cooper was right in front of you. Finally, "An Offering" brings the record to an intimate close. There's an ease to Cooper's delivery that welcomes you to every song with an outstretched hand. It's no wonder, given the impact of his speaking events. Honest and passionate, Wake the Dawn encompasses the core of Cooper's ministry: saying to God, "This is what I have to offer, use it, take it, do with it what you will." Produced by Tom Booth, Wake the Dawn is a praise and worship album that draws in listeners of all ages. Cooper's voice catches your ear from the second you hit play. The 11 songs range from full-blown rockcomplete with drums, Hammond B3 organ and the guitar licks of Taylor Johnsonto straightforward, personal ballads.